When I am on a mountain expedition the skill of navigating across open country using OS maps and a compass is part of the enjoyment but I don't get a great kick out following roads in an atlas when on the bike or in the car. I want to enjoy the ride, check out the scenery and improve my riding skills. Being distracted by trying to read a vibrating map on a tank bag or stopping regularly to find my route in an atlas is not part of the fun. For biking satnav is great. A nice clear map which always shows my current position plus a simple arrow and a voice prompt giving me directions is far preferable. No more crawling along trying to find that side street that the local village idiot told me was `just down there on the right'. With the satnav I know it's 500, 400, 300, 200 yds away. In the car, the satnav has, with a couple of button pushes, found a way around major traffic hold ups. On the bike it's got me all over Europe without ever having to refer to a map and found fuel when I was getting desperate plus hotels and cash machines. My First Satnav - Tomtom Rider. Shortly after I bought the GS the Tomtom Rider appeared and it seemed perfect, even at the £600 price tag! I bought one and after a lot of hassle with the Mickey Mouse fitting kit with the chocolate screws fitted it to the bike's screen mount. For a while I thought it was wonderful and it is a pretty good bit of kit for getting from A to B. Then the disillusionment started. The original Rider only had UK maps so I spent £100 plus on maps of Europe and a larger SD memory card. Then I discovered that Europe was divided into a number of maps and although I could get them all onto one card the satnav could only read one at a time. Door to door from France to Germany, for example, meant navigating with one map to the border, then changing to the next to the destination. OK I could live with it but then I found setting up long routes with waypoints was a pig. The final straw was when I had the well documented bracket problems. At that stage, after spending £600 on the satnav, £30 on a RAM mount to replace the supplied crap, £100 on maps and £30 on an SD card, I gave up and bought a Garmin 2720. Much better than the Rider but my wife now has a nice new Rider Mark II which full European mapping which was a free gift from Tomtom. Update May 2009. Guess what? The nice new Rider II has packed up. I guess another Garmin is the only real fix. After the Rider the Garmin was a breath of fresh air. It came with loads of car mounting hardware and a few extra pounds added a bike bracket which was fitted to the RAM mount. The Garmin software proved to be much more logical to use than the Rider with fewer button/screen taps required to do anything. Multi-waypoint route planning was a doodle and I never had a problem with the bracket (well I had one, more later). The biggest plus however was the Mapsource PC software which, still today, Tomtom have nothing to compete with. At the time my wife and I were planning a European tour and the whole thing was done in Mapsource, we never opened a paper map. Once our plans were finalised it took about one minute to transfer the route to the Garmin and all that was left was to drive it. 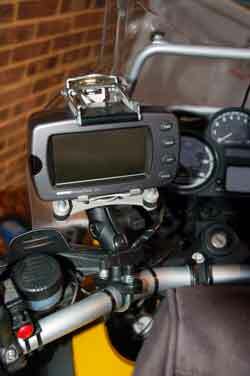 The Garmin was originally fixed to the screen bar with a RAM mount which worked OK but it did vibrate a bit so it was changed to a nice aluminium bracket from Motorrad Concepts which fitted above the clocks. It looked smart, did not vibrate and was easy to see. It did however have two minuses. Firstly the little screw that locked the satnav to the mount was hard to get at and secondly, it was hard to reach over the tank bag on those occasions when I needed to tap the screen on the move. Neither of these minuses would have prompted a change until the satnav came off the bike and bounced down the road - on a mountain pass in Italy. It was my fault, I had not tightened the little screw, but I lost faith in the Garmin bracket. As our route took us past the Touratech factory in the Black Forest I dropped in and bought a Touratech bracket. It looks like a bit of mad scaffolding but works. The different design meant the fitting had to be changed and after experimenting with a number of ideas I found that mounting it on a RAM mount on the left handlebar was the best. It's easy to read as it appears just to the left of the speedo, I can reach it without a stretch and it does not vibrate. Perfect. There seems to be a school of thought that requires a satnav to be powered direct from the battery so it can be used when stationary. I keep wondering why. The Rider and new Garmin Zumo have batteries anyway, the 2720 doesn't but in two years I have not experienced a problem with turning on the ignition/engine for the 30 seconds it takes to enter a destination and I don't have a live cable floating about when the bike is parked and the satnav removed.. It's possible to wire it from the back of the bike power socket but there is a dedicated socket to the left of the headstock hidden by the covering over the wiring loom. Ease it out and plug in there, it's conveniently close to the front of the bike so cable runs are easy and it's ignition controlled. It is an odd socket but you can get a plug from a BMW dealer or do what I did which was take the plastic cover off the socket, solder over the ends of the satnav. cable to make two small stiff pins and push them in the socket. Jam the cover back and cover with insulating tape. I did it as temporary installation two years ago but it now now become permanent. It started as an experiment to see how good Mapsource was. The laptop was plugged into the plasma TV and my wife and I started playing with route ideas. This developed into making anywhere that looked "promising" into a waypoint and using Mapsource's ability to link waypoints with data we linked each waypoint to a photograph or web site which showed why we wanted to go there. Finally we had a long list of waypoints over eight countries we started perming them together in various ways to see what sort of route we could come up with. Mapsource made it easy to check driving times and distances and define potential night stops. Some possible routes were transferred to Google Earth with one button press so we could look in detail at the terrain and "fly" the route. This exercise took up many winter evenings and was even better than poring over maps and guide books. When we came up with our definitive route we just plugged the satnav into the laptop and transferred it across. The final thought was "why not take the laptop with us". We never seem to stick to a holiday plan so it seemed a good idea but the laptop would not fit in the top box. The solution was a little Philips Freevents laptop with a 10.5 inch screen. It proved a great idea, not only were we able to, easily, re-plan from hotel rooms and cafes but we could use wi-fi hot spots to send emails and check out ideas on the web. We also used it to listen to Radio 2 in the mornings. During a temporary job driving trucks my Garmin 2720 was stolen from the cab. I used the Tomtom Rider for a while but it wanted to route me the wrong way on one way streets and often wanted to turn right where it was illegal so the the Garmin had to be replaced with another Garmin. As I could not find another 2720 I bought a Zumo 550. There is a lot that I like about the Zumo. The MP3 player is great, as is the hands free phone use. The navigation is still pretty good but its a shame the nice easy to read arrow on the screen showing next turn has gone and it is not possible to "tweak" ones own road preferences. The divert option has been simplified and does not work so well. The 2720 gave the option to set the distance to avoid, the Zumo just has "divert". Both bike and car brackets are well designed (apart from the stupid locking screw on the bike bracket that has now been replaced with a thumb screw). It is easy to connect to my Autocom on the bike, the car bracket has audio in and out as well as on board speaker and mic, it takes an external antenna (which does not seem important until you want to use it in a vehicle that screens sat signals). To sum up. 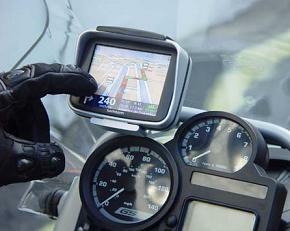 Its head and shoulders above the only alternative, the Tomtom Rider. Although on the surface it is a bit more expensive, when one starts comparing what is in the package and adds the better quality and vastly better after sales service there really is no alternative.